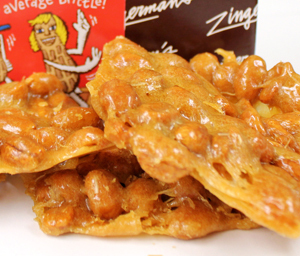 Our latest concoction from the candy kitchen foregrounds the full-flavor of fresh-roasted Jumbo Runner peanuts. “I use cane sugar like everyone else, but we cook to shades of deep gold to bring out all the flavor, and the peanuts are in there long enough to roast perfectly,” notes candyman Charlie Frank. Contains milk, peanuts. May contain tree nuts, egg.